The OnePlus 2 was released to the public this week, but due to the controversial invite system the "2016 flagship killer" isn't the easiest device to get a hold of. This hasn't stopped iFixit from obtaining the device though, allowing them to perform one of their signature teardowns. In the company's teardown, iFixit discovered that the OnePlus 2 is surprisingly easy to repair. The first step is to remove a plastic cover held in by standard Phillips-head screws, revealing a collection of components including a bright red 3,300 mAh battery. Many of the components within the OnePlus 2 are modular, meaning they can be replaced easily and independently, hopefully saving the owner some cash when it comes to repairs. Unfortunately the LCD panel is fused to its protective glass, making it the most expensive and difficult part to repair. 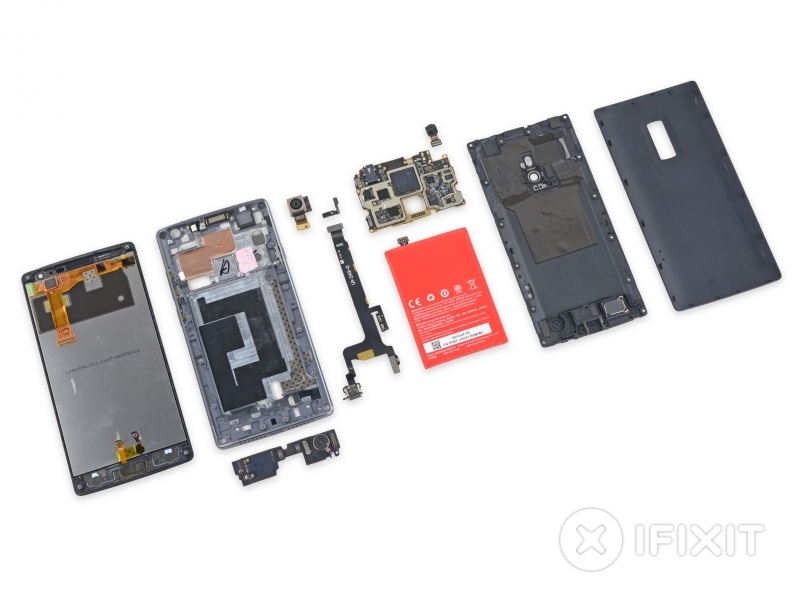 iFixit's teardown also revealed exactly what hardware OnePlus has used in the OnePlus 2. The 13-megapixel optically-stabilized rear camera uses an OmniVision OV13860 sensor, while the 5-megapixel front camera is also an OmniVision unit. Both the LPDDR4 memory and the 64 GB of internal NAND were produced by Samsung in iFixit's model. The OnePlus 2 was awarded a score of 7/10 for its repairability, which is pretty decent for a flagship smartphone. If you're interested in how the OnePlus 2 has been constructed, it's well worth checking out iFixit's teardown in either written or video form.